The SYSTEM tablespace is created with manual segment allocation and as such it is not possible to run the SHRINK command for the objects that are located within. However, if the AUD$ table is moved to another tablespace (locally managed with automatic segment space management) then it can be shrunk. It is recommended to use shrink on the AUD$ only during a downtime window, since part of the shrink operation will use incompatible locks. (SUM(BYTES) / 1024 / 1024) "SEGMENT_SIZE(MB)"
Database auditing is the process of recording, monitoring and reporting of the actions performed on a database. It allows the security auditors to observe whether the database users are using the database according to the established policies and that there are no policy violations. Database Auditing facilitates the analysis of the database activity patterns/trends and it can help in the process of gathering the historical data about a particular database user or activity. One can use standard auditing to audit SQL statements, privileges, schemas, objects, and network and multitier activity. Alternatively, one can use Fine Grained Auditing (available only in Enterprise Edition) to monitor specific database activities based on factors such as actions on a database table or times when those activities occur. FGA is very flexible since the audit_condition can reference a PL/SQL function that will control whether the audit record is produced or not. The database standard auditing is a feature available by default in all the database editions. To use auditing one must first enable it and then define exactly what must be audited. The audited actions are recorded either in the SYS.AUD$ table or in operating system files. OS：The auditing is enabled. On Unix the audit data is written to text files which are located in the directory specified via AUDIT_FILE_DEST. On Windows the audit data will be sent to the Event Viewer. 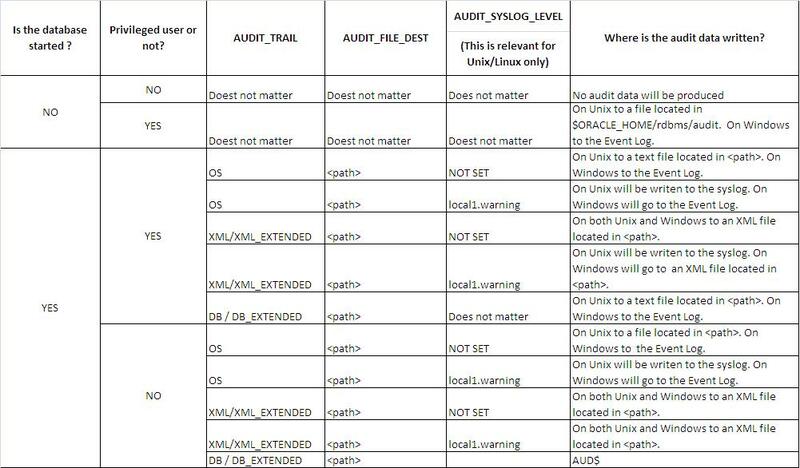 XML：The auditing is enabled and the audit data is written to XML files which are located in the directory/folder specified via AUDIT_FILE_DEST. This is the case for Windows as well.